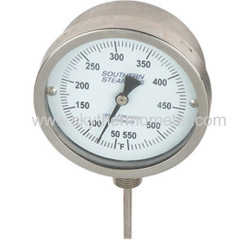 (1)Range of Temperature:50-550F, or can according to customers' requirement. (5)Special function: the outer ring can be rotated. (7)Connection:1/2"NPT,1/2" BSP,or according to customers' requirement. (9)Length of probe:63.5mm(with thread length),or according to customers' requirement. (10)Usage: can be widely used in all kinds of instrument in fields of industrial, chemic,petrolic ect, measure liquid,gas, solid temperature directly and accurately, easy to use and installion.